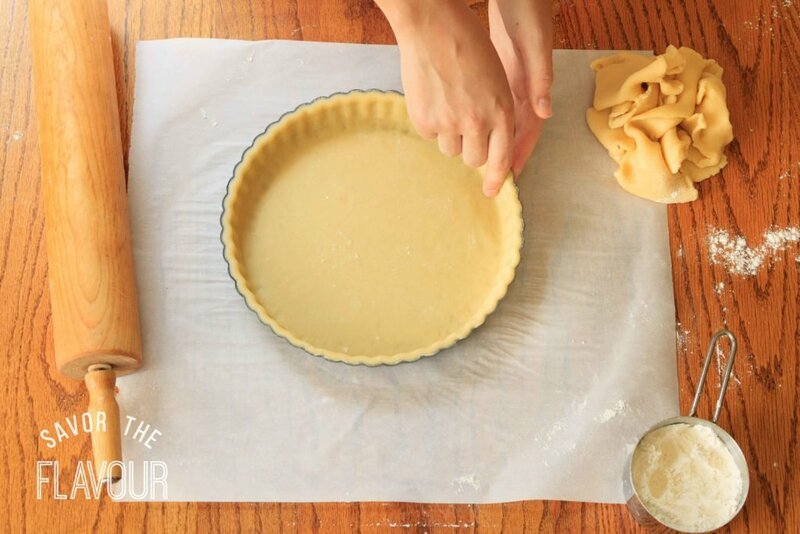 The easy way to perfectly line a loose-bottomed tart pan. You'll love how elegant your pies and tarts will look--and it's really simple to do. Just over a year ago, I used a loose-bottomed tart pan for the first time. What impressed me the most about this kind of pan is how you can remove the whole pie from the pan to serve, revealing a beautiful fluted edge of golden pastry. The trouble is, lining a tart pan with pastry is a little different than lining an ordinary pie plate. Here’s an easy method on how to line a tart pan that works with un-enriched and many enriched pastries. 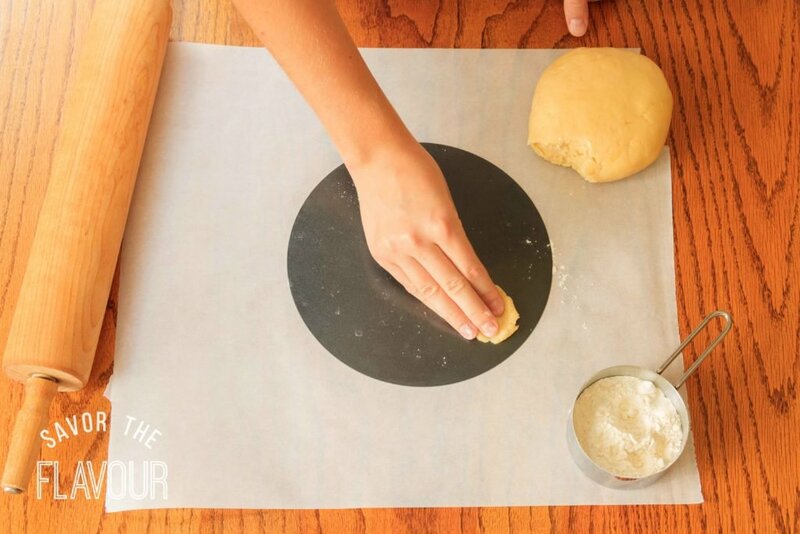 Start by placing the round base of the pan on a large sheet of parchment paper. Pinch off a small piece of dough from the ball of chilled pastry and stamp it all over the pan’s base. This will help the flour stick more evenly to the base. Sprinkle flour over the base and parchment, smoothing the flour on the base to coat it evenly. If you’re using an enriched or sweet pastry, you will probably have to use extra flour. 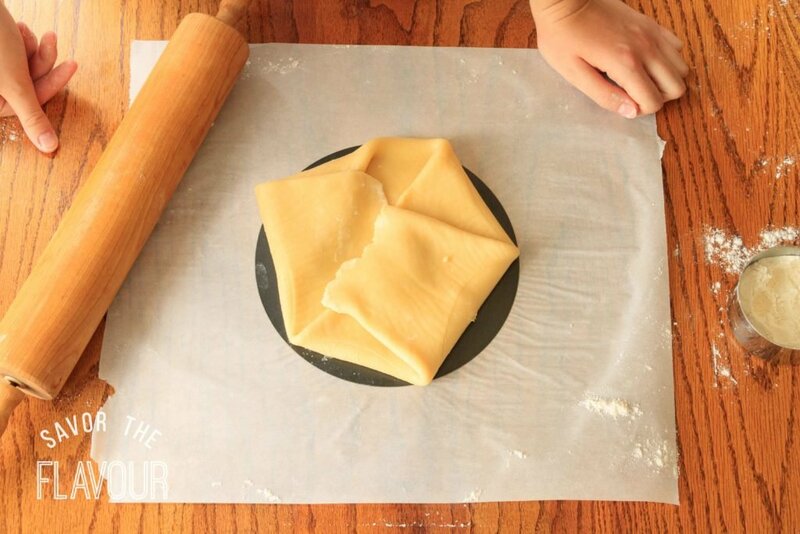 Place the disk of pastry in the center of the floured base, sprinkle some flour on top, and begin to roll it out. 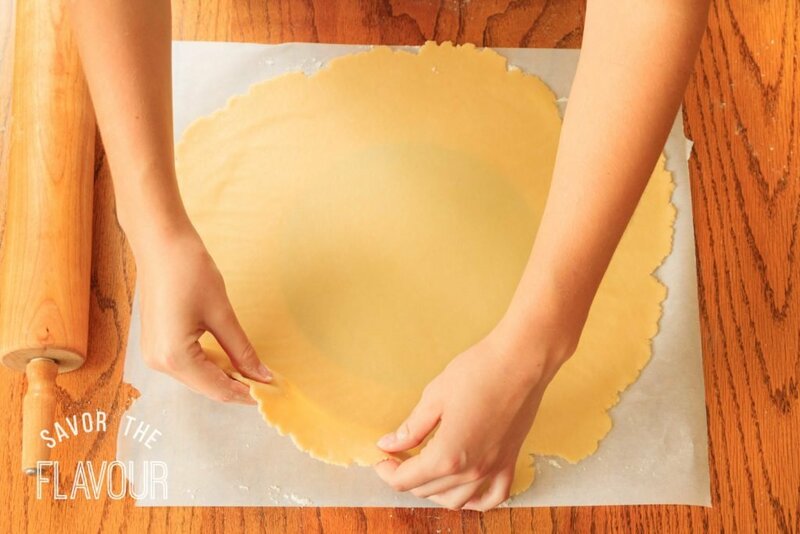 The pastry should be fairly thin–no thicker than 1/8″ at the most. 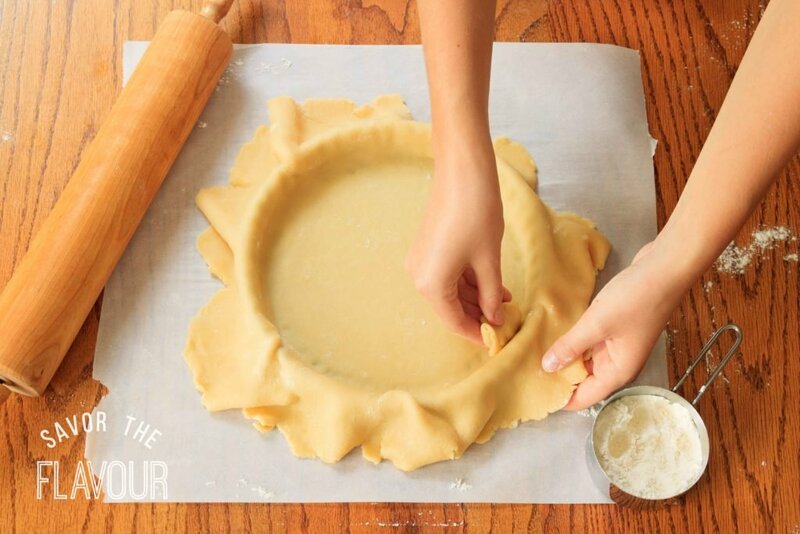 To see if the pastry has stuck, slide a thin, floured spatula under the edge of the pastry, all the way around. Add extra flour underneath if necessary. 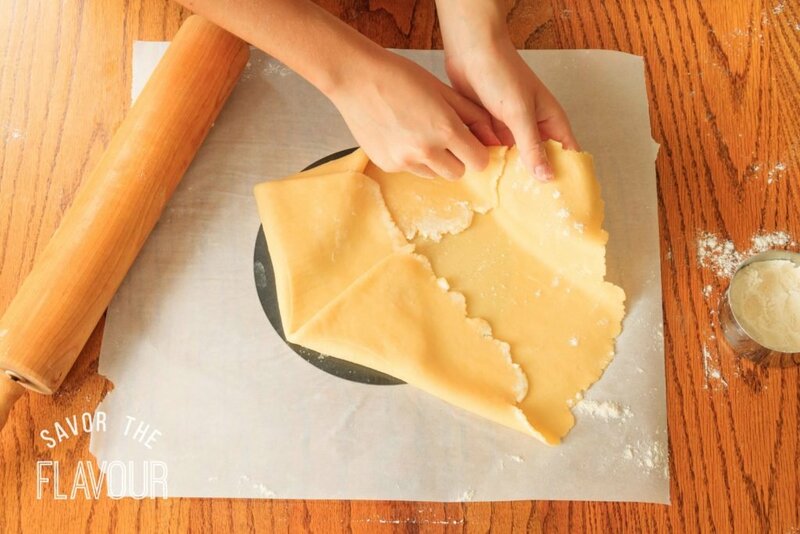 This step is especially important if you’re using a more delicate pastry. 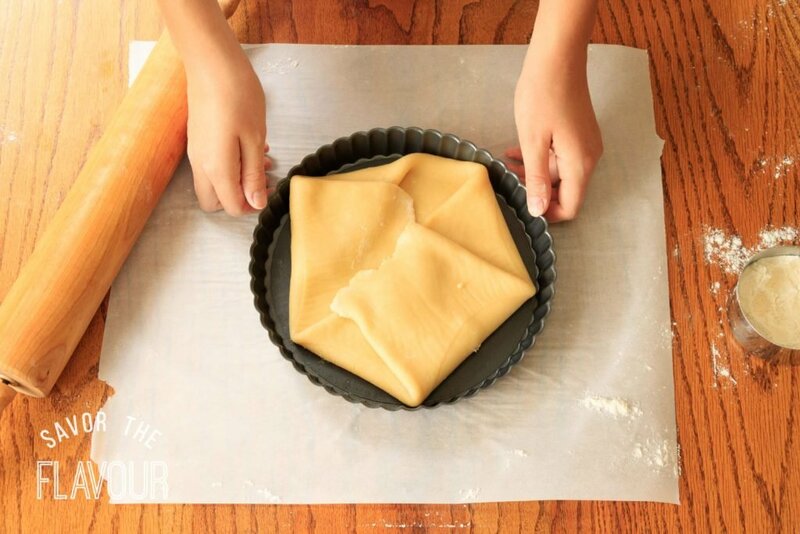 Next, fold the edges of the pastry onto the base to make a hexagon shape. Pick up the base and put it inside the fluted part of the pan. Then, unfold the pastry over the sides of the pan. 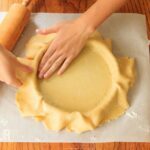 Make sure the pastry goes right into the corner between the base and sides by lifting up the edge of the pastry and gently pushing it into the corner with your fingers. Do this all the way around the pan. Pull off some the excess pastry and ball it up. 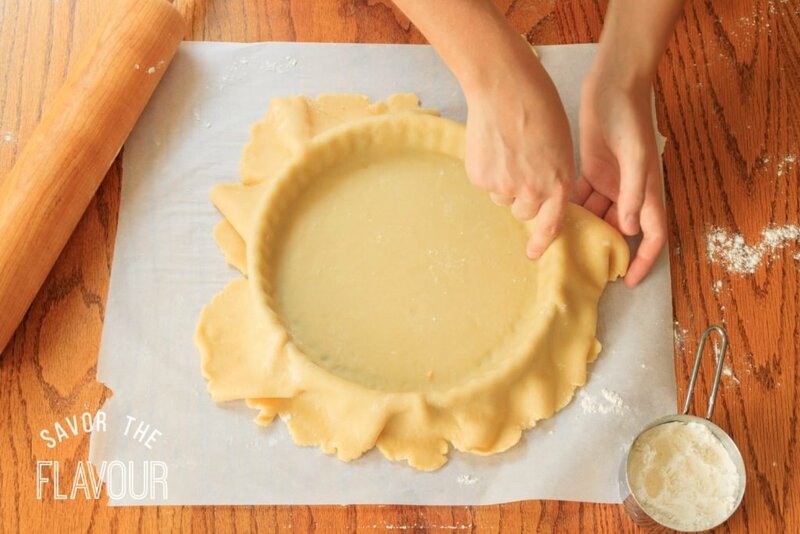 Use this piece to help push the pastry into the pan’s fluted edges. 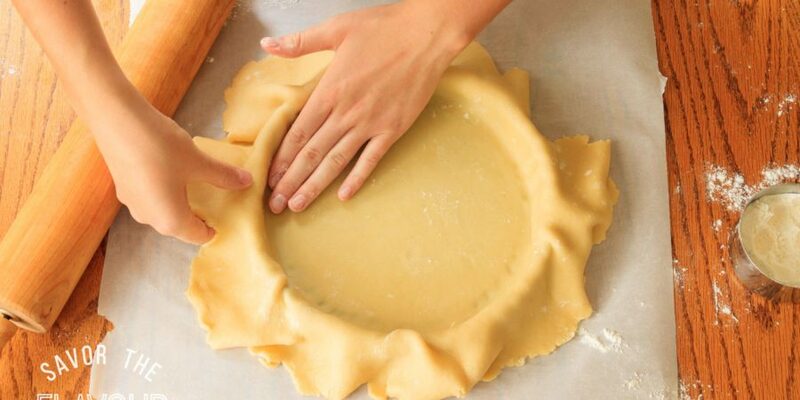 Then, repeat the process, using the side of your index finger instead of the ball of pastry. 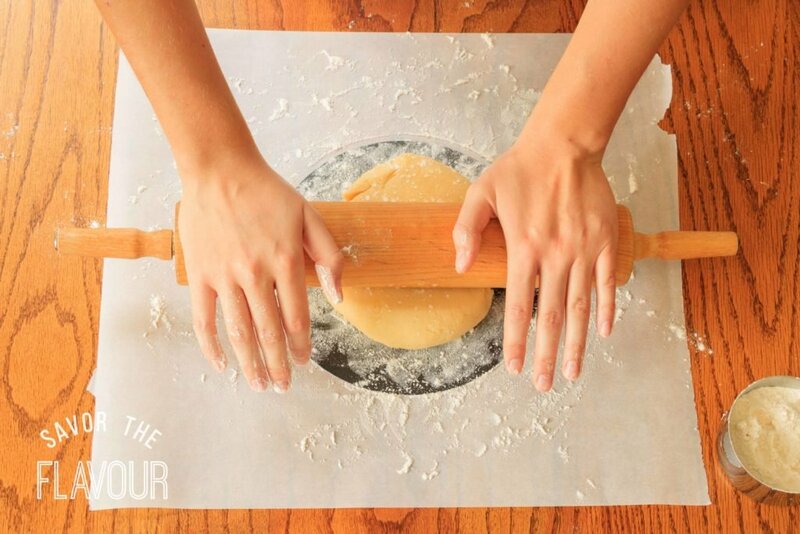 Trim off the excess pastry by rolling your rolling pin over the top of the tart pan. The edge of the pan will cut off the excess in a jiffy. Gather up the scraps and save them for another bake. 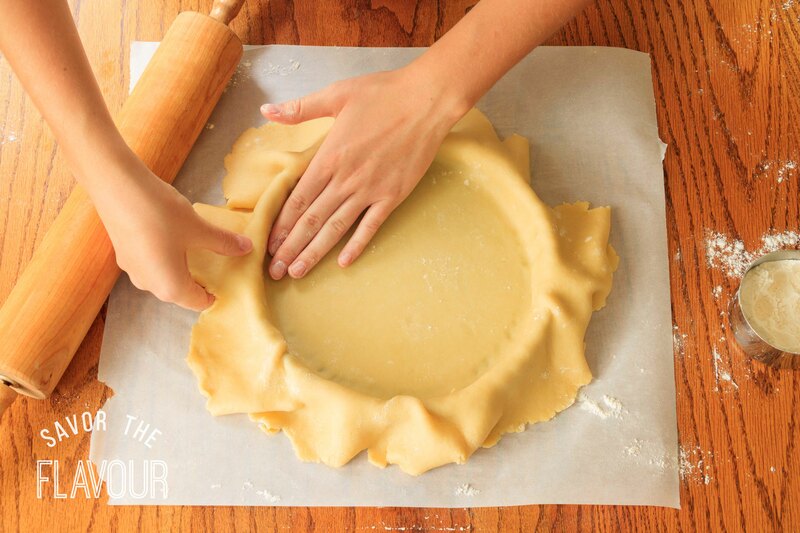 Then, gently press the pastry into the fluted edge with the side of your finger again. This ensures a lovely fluted edge on the baked tart. Now, the pan is fully lined and ready to be chilled and baked. If you are blind baking your tart, please read my post on how to blind bake pastry. I hope these techniques will help you line a tart pan with ease and precision. Feel free to share any tips and tricks you have for lining a tart pan in the comment section below. 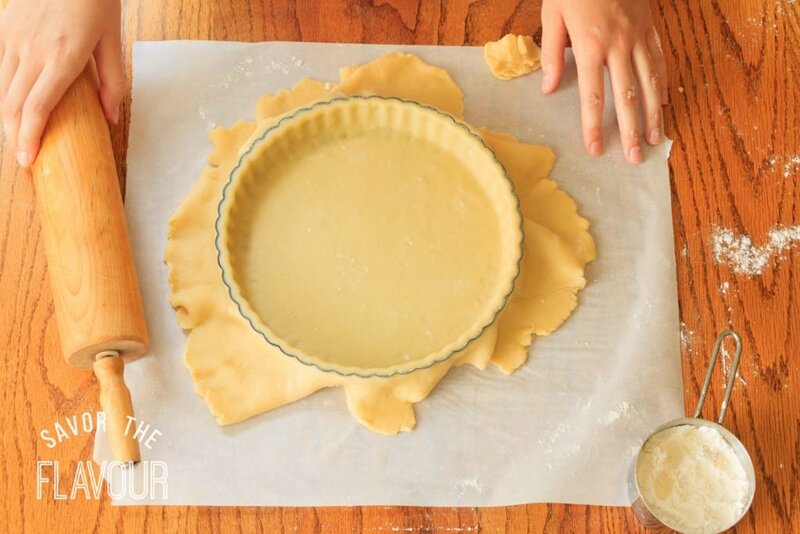 The easy way to perfectly line a loose-bottomed tart pan. You’ll love how elegant your pies and tarts will look–and it’s really simple to do. Now, the pan is fully lined. Chill for 10 minutes, then bake. If you are blind baking your tart, please read my post on how to blind bake pastry.